This is to inform that by clicking on the hyperlink, you will be leaving sc.com/fk and entering a website operated by other parties. Gradients, wind and the threat of bad weather make this one of the toughest marathon courses! Please read all this registration information and the entire entry form before completing and submitting it. An incomplete and unsigned form will not be accepted. There is no walkers’ race as such but as with previous years those who wish to walk the course are welcome to take part. However, please note that drinks stations along the course may have to close and marshals return to the finish as consistent with the 4 o’clock close. Anyone finishing after 6 hours may receive a medal and certificate but the time might be shown only as 6:00:00+. Races are “open” with no sub-categories based on age, experience, nationality etc. Teams may be made up of 4 men, 4 women or combinations in between. The men’s, women’s and team races will be run together. Distance 26 miles, 385 yards (42.195kms) 4 runners: 3 covering 6.25 miles (10km) each and the last covering 7.35 miles (12.195km). Age Eligibility 18 years and above as at 24th March 2019 Each runner 18 years and above as at 24th March 2019. The team prizes are per team, NOT per participant. Prizes are awarded gross of any tax or other statutory deductions that may be levied. There is also a Challenge Trophy and a cash prize for the first Falkland Islands-born runner to finish. Participants completing the course will receive a medal, certificate (with finishing time) and soft copy photographs and dvd. All entry fee proceeds will go to Seeing Is Believing Cause (see below). Every 5 seconds someone goes blind. There are up to 39 million blind people in the world today yet 80% of blindness is avoidable or treatable and it costs only £20 to restore sight to one person with a simple eye operation to cure cataracts, the world’s leading cause of avoidable blindness. Seeing is Believing (SiB) is Standard Chartered Bank’s global programme to help tackle preventable and curable blindness. Through our funding, we’ve helped to bring affordable eye care to some of the poorest communities across the globe. Since launching in 2003, SiB has helped over 45 million people, giving more than 2.91 million people their sight back. In September 2011, we pledged to raise USD100 million by 2020 for sustainable eye-care programmes, aiming to reach 50 million people. We make sure your donation has the maximum impact, thanks to our partnership with the International Agency for the Prevention of Blindness (IAPB) and leading eye-care organisations. Raising sponsorship is not a pre-condition of taking part in the marathon but we ask that if you do raise funds, we ask you to consider using this opportunity to raise funds for SiB. Sponsorship forms may be obtained from the Bank or downloaded from our website. All entry fees and any money raised on the day will be donated to SiB. Participants must be 18 years of age or older on 24th March 2019. Any participant attaining the age of 18 between submission of their entry form and 24th March 2019 will be asked to counter-sign their form once they are 18 and on or prior to 24th March 2019. Entry forms must have all mandatory fields completed and be signed when submitted. Relay race: each member of the team must complete a separate entry form, which should clearly state the name of the team and team captain. The registration fee must accompany all entries at the time of submission. Should be made to Standard Chartered Bank, Stanley either by hand to the Enquiries desk during office hours (8:30 to 3:00, Monday to Friday, except Wednesday 9:00 to 3:00) at Ross Road, Stanley or by mail to PO Box 597, Stanley, Falkland Islands FIQQ 1ZZ. No faxed or emailed forms can be accepted. All successful entry applications will receive a confirmation of acceptance. Applicants from MPA are warned that in previous years, some entry forms posted at MPA were misdirected to the UK (in MOD mail) and a couple were not received in time for the race. They may wish therefore to contact the bank to confirm the application has been received. Only applicants submitting their forms by close of business Friday 22nd February 2019 can be guaranteed a medal on the day upon successful completion of the distance. (Overseas applicants may advise by fax or email the submission of an application by this date to guarantee their medal and certificate but the actual application will not be deemed to have been made until received in its original form). Regrettably requests for cancellations and thereby return of entry fee cannot be entertained. It is advisable for all persons wishing to participate in the marathon or team event to review the following questions before completing their entry form. Has a doctor ever said that you have a heart condition and that you should only do physical activity recommended by a doctor? In the past month have you had chest pain when you were doing physical activity? Is your doctor currently prescribing drugs for your blood pressure or heart condition? Do you have insulin dependent diabetes? If you have answered yes to any of the above questions we strongly recommend that you seek advice from your doctor before you register and forward your entry for the race(s). While participation in the event shall always be at the sole responsibility of the individual participant the organisers reserve the right, if they are in any doubt about a person’s physical state, including whether the person is considered to be under the influence of alcohol, to advise a participant against running and if the participant ignores the advice, to refuse to recognise that person as an official participant in the event by withdrawing the person’s number. In Falkland Islands pounds or Sterling only. Please ensure you complete a pay-in slip and have the counter-foil stamped as proof of payment. available to customers of Standard Chartered Bank, Stanley only. Please complete the appropriate section on the application form. Race starts at the Bank / Town Hall car park on Ross Road. The route heads WEST along Ross Road West to Mink Park then returns along Jeremy Moore Avenue back past the bank and continues on to Ross Road East and Rowlands Rise. From the top of Rowlands Rise East turn left along the Airport Road (on the south (right) side of the road) to the airport. At the airport, go through the car park and double back onto the road (always on the right side of the road) – past Rowlands Rise (where the route joined earlier) and all the way past Pony’s Pass Quarry and half way up the hill to the turnaround point. Here the route doubles back (always on the right side of the road) back down Rowlands Rise, Ross Road East and to the Bank and the finish. The route will be marshalled to give advice, assist with safety and to check that runners stay on the correct route. Please note, it is not possible for roads to be closed so it will be important for runners to stay aware of their surroundings at all times. Where are the relay handover points? How does the route measurement? The race has full AIMS (Association of International Marathons and Road Races) accreditation and is officially the world’s most southerly certified road marathon. How to verifying that participants have completed the route? Marshals will be posted along the course to mark off runners as they pass certain points on the route. Participants will have had to pass all checkpoints to qualify as a finisher. Where are the water stations? In line with usual marathon provisions water stations will be provided along the course at approximately 2½ to 3 miles apart. Some stations will have sports drinks as well (although runners are advised to avoid any drinks unless they have trained with them) and some stations will have basic first aid kits (such as sticking plasters and Vaseline) to be self-administered. 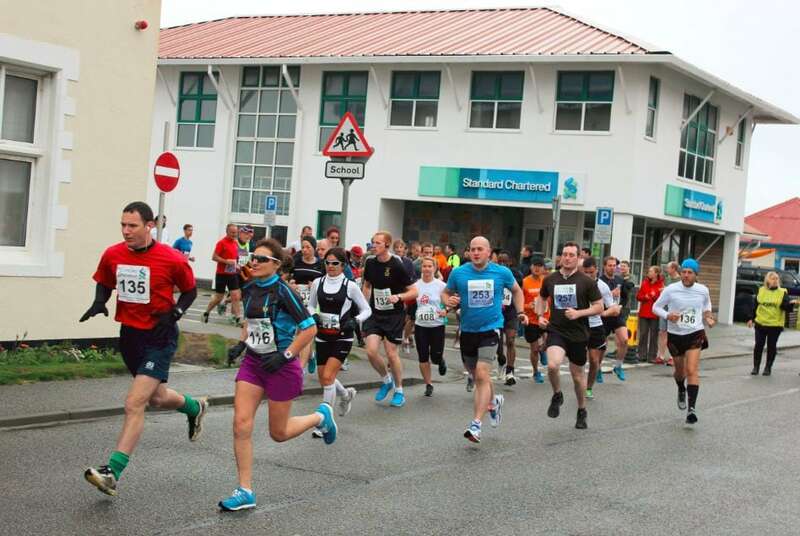 The weather in the Falkland Islands is unpredictable and the wind especially can be difficult for the runners. March has been chosen for the race in the hope that the summer winds will have died down but the temperature not dropped too much. Nonetheless, it is possible that the weather on race day will be windy and running into the wind can be particularly uncomfortable. It is unlikely that the race will be cancelled due to the weather but if it is especially bad the start may be briefly delayed (if a delay might help runners) and/or the finish close later (to allow longer to complete the course). Runners should note that experienced marathoners have described the course as one of the toughest they have run. Nonetheless, the tougher the race the greater the feeling of achievement upon finishing! Is there an official time keeper? Although times may be taken around the course and participants may have their own stop watches there shall be one official time keeper and the times recorded by this time keeper will be the undisputed official times. Who can I contact for clarification and further information?